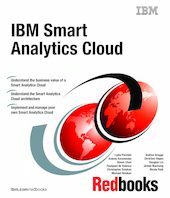 This IBM Redbooks® publication presents a Smart Analytics Cloud. The IBM Smart Analytics Cloud is an IBM offering to enable delivery of business intelligence and analytics at the customer location in a private cloud deployment. The offering leverages a combination of IBM hardware, software and services to offer customers a complete solution that is enabled at their site. In this publication, we provide the background and product information for decision-makers to proceed with a cloud solution. The content ranges from an introduction to cloud computing to details about our lab implementation. The core of the book discusses the business value, architecture, and functionality of a Smart Analytics Cloud. To provide deeper perspective, documentation is also provided about implementation of one specific Smart Analytics Cloud solution that we created in our lab environment. Additionally, we also describe the IBM Smart Analytics Cloud service offering that can help you create your own Smart Analytics cloud solution that is tailored to your business needs.